1. MOLYBDENUM DISILICIDE OBTAINING/ Nicolae Angelescu, Gabriela Ionescu, Veronica Despa, pp. 6-8. Abstract. Molybden disilicide is one of the most known metallic silicides and of its specific properties it can be used in the top of fields of the world-wide techniques. The work deals with the synthesis of molybdenum disilicides. Some information about the evolution of molybdenum disilicide synthesis in varying temperature conditions and the influence of reaction environment are given; the synthesis has been carried out in the random presence of other forms of molybdenum silicides. Other molybdenum silicides which can appear in the process have been shown, too. Concomitantly, the conditions of coexistence for these products are presented. The results are confirmed by the X-ray diffraction analysis and microstructural observations. Abstract. The hydrothermal method provides a wide range of possibilities for processing of materials whether it is bulk single crystals, or fine particles, or nanowires. Hydrothermal materials processing has a lot of advantages such as a singles step process, low energy technique and low temperatures. In this paper present the results of synthesis of ZnO nanowires by hydrothermal method from 0.04 M of Zn(NO 3 ) 2 6H 2 O and C 6 H 12 N 4, solutions using ZnO:Al thin film substrate. Temperature was keep constant at 90 o C for 2 hours. Nanowires of ZnO were clean with DI water and drayed with nitrogen and structural and morphological characterized. 3. SLIVER DEFECTS ON LOW CARBON STEELS, COLD ROLLED STRIPS / Dumitrescu Alexandru Traian, Catangiu Adrian, pp.14-18. Abstract. One definition of slivers could be: defects in the nature of irregularly shaped pieces of steel clinging loosely to finished steel. Slivers may result from defective composition (over-oxidized, high sulfur); defective teeming of molten steel; defective heating (burning); tearing of corners in early stages of rolling; etc. So, from the definition is obvious that the origin of slivers could be in different stages of steel flow route but, the main source of slivers is related to nonmetallic inclusions formed and entrapped on the subsurface of continuous cast slabs, as are FeO and Al 2 O 3 . These inclusions are generated by mould slag entrapment on solidifying shell, re-oxidation during continuous casting by air, refractory materials, ladle slag, etc.The present paper contains metallographic analysis of areas connected to slivers from 5 cold rolled coils of strips with thickness varying between 1.8mm to 4.1mm and the carbon content from 0.04% to 0.188% and in all analyzed areas have been observed only FeO inclusions related to slivers defects, inclusions formed during continuous slab casting process. 4. 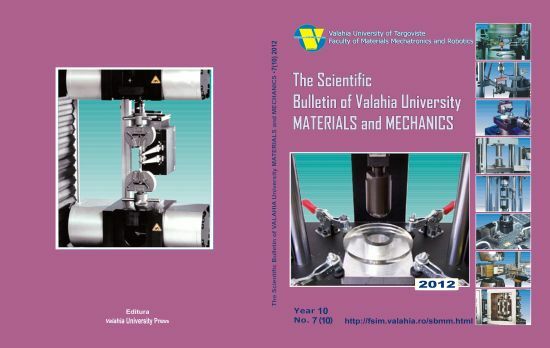 MODERN METHODS AND PROCEDURES FOR SUBMISSION OF THIN LAYERS IN VACUUM / Ciprian Manescu, Gheorghe Ionita, Carmen Popa, pp.19-22. Abstract. This paper tackles bringing to the attention of the specialists in the field, of some modern methods of increasing wear resistance of tools, for working wood. Thus, the results are processed and analyzed by laborious experimental testing procedures for submission of thin layers in vacuum, using the cathode pulverization, type magnetron. The experimental tests were performed on modern installations, using the performing equipment of measurement and control, both the working parameters, and the thickness of the deposited layers; they were conducted in the laboratories of University Cluny of France . 5 . MODEL AND COMPUTER PROGRAM FOR RADIATION DIMENSIONING AIR HEATERS USED HEATING FURNACES / Dorian Musat, Mihai Udriste, pp.23-28. Abstract. This paper presents the mathematical model used in sizing the heat recovery of radiation type heating furnaces equipped room in metallic materials industry. Sizing the heat recovery of radiation type heating furnaces equipped room requires laborious calculations , so that the sizing transcribed mathematical model of radiation heat recovery in a computer program in Microsoft Excel with which checked the sizing recovery heat furnace to heat radiation that equips available in “ Laboratory Termotehnological Aggregates " in the FIMMR - University of Targoviste Valahia. With new software , sizing radiation heat recovery becomes easy and fast and requires minimal operator training in programming. 6. OPTIMAL MANAGEMENT OF MELTING IN ARC FURNACES FOR STEEL DEVELOPMENT/ Valentin Rizea , pp.29-32. 7. THE HYDRATION OF SUPER ALUMINOUS CEMENT AND THE MECHANICAL STRENGTH DEVELOPMENT / Cristina Stancu, Nicolae Angelescu, Vasile Bratu, pp.33-38. Abstract. The use of super aluminous cement based on mineralogical compounds whose refractoriness is high as possible, is economically and technologically desirable. However, with increasing of the alumina content in the composition of mineralogical compounds from the aluminous cements, their reactivity towards water decreases. Therefore, this paper aims to monitoring the evolution in time of development the mechanical strength of aluminous cement based on mineralogical compounds with highly refractoriness properties: CA, CA 2 and CA 6 at ambient temperature. For this we will monitor the evolution in time of the anhydrous mineralogical compounds hydration and their transformations from metastable forms into stable forms using X-ray diffraction and their influences on the development of mechanical strength. 8. Spectral Identification and HPlc quantification of benzoic acid from natural juices/ Rusandica Stoica, Sanda-Maria Doncea, Virgil Badescu, Raluca Senin, Rodica-Mariana Ion, pp.39-41. Abstract. Benzoic acid from four natural juices was investigated in this paper. The identification of benzoic acid was achieved with FTIR using ATR technique. A high-performance liquid chromatography (HPLC) with photodiode array detection (PDA) method was developed for determination of benzoic acid. The highest concentration of benzoic acid was found in orange juice in the range of 71 mg·L -1 . Precision, linearity, sensitivity (limit of detection and limit of quantitation) and uncertainty were established. The obtained results suggested that ATR and HPLC are suitable methods for the identification and quantification of benzoic acid in natural juices. 9. CONSIDERATIONS ON SIZING THE PREHEATERS OF THE FURNACES/ Dumitru Stroescu, Gaba Aurel, pp. 42-48. Abstract . Recovering the exhaust heat from metal industry's furnaces is realized, in general, by preheating the combustion air. Thus, the exhaust gases are discharged through the chimney with lower temperatures and lower energy content. When in the gases exhausted from the furnaces, the sulphur oxides are found, at lower temperatures, the low temperature corrosion occurs affecting the air pre-heaters. It is therefore important to size the air pre-heaters so as to avoid the low temperature corrosion. For sizing the air pre-heaters, a computer program is used, by which the recovery solution to avoid the low temperature corrosion can be established. Such constructive solution, together with the experimental results obtained during the operation, is illustrated. 10. MATHEMATICAL MODEL AND COMPUTER PROGRAM FOR SIZING AIR CONVECTION HEATERS USED TO HEAT TREATMENT FURNACES / Mihai Udriste, Dorian Musat, pp.49-56. Abstract. This paper presents a mathematical model and computer program for sizing air convection heaters, heat treatment furnaces used to reduce energy consumption of the furnaces used in steel construction materials. Mathematical model for sizing of the convection air heaters for heat treatment furnaces , was transcribed into a Microsoft Excel program. With its recovery to a dimensioned and calculated data were compared with experimental ones, resulting in minimal differences. Abstract. Heavy metals pollution has become a topical issue caused by excessive industrialization at present human activities with a large number of sources of pollution with these compounds. The high toxicity of chromium and its compounds caused important measures to prevent pollution with them, fixing rules governing maximum permissible concentrations or recommended for chromium in drinking water, food, sewage to be discharged into sewers or emissaries from natural air, soil. CMA (maximum permissible concentration) for total chromium varies from 1.5 mg/dm 3 to water according to SR ISO 9174: 1998, and hexavalent chromium concentration is 0.2 mg/dm 3 according to SR EN 1998: 11083. CMA for chromium in soil is 100 mg/kg. In biological terms, hexavalent chromium is classified in risk group 1 carcinogen and is known as a powerful lung carcinogen. This has sparked the interest of researchers on the heavy metal, with numerous studies of characterization and its recovery of affected environments. Several issues related to the adverse effects of chromium, hexavalent and human health in particular, and some preliminary results for its adsorption on the surface of magnetite, are presented in this paper. 12. ANALYZE OF THE ANODIZING PROCESS PERFORMED ON TITANIUM ALLOYS SURFACE / Valentin Togan, Sabrina Grassini, Gheorghe Ionita, pp. 61-64. Abstract. In the last few years, the anticorrosive research area of titanium used in medicine was focused on the improvement of the materials' quality surface, by different techniques as anodizing, and the examination of the electrochemical corrosion resistance. This study deals with the analysis of the anodizing process, equipments and techniques, used to perform the laboratory test. The results achieved by optical microscope techniques, show that the surface morphology of the oxide layer obtained after anodizing process, is strongly dependent on the process parameters like electrolyte chemical composition, cell voltage, temperature, time etc. 1. Modeling of a micro-gripper compliant joint using COMSOL Multiphysics simulation/ Mihaita Nicolae Ardeleanu, Veronica Despa, Ioan Alexandru Ivan, pp. 66-70. Abstract. COMSOL Multiphysics is a popular finite elements modeling (FEM) software tool used in by most research teams around the world. To validate its working performance, the present paper introduces a model that simulates the behavior of a micro robotics compliant arm. The device is in progress under the research project ADMAN . Emphasis is laid on designing the geometrical model, on applying the mechanical loads and on observing the simulation results in terms of beam stiffness, maximum stress at compliant joint level and eigen frequencies values. 2. Tridimensional modeling of hydrodynamic sediments/ Petru Boeriu, Alexandru Moldovanu, Vlad Vaduva, pp. 71-73. Abstract. Sediments of the sand particle dimension or bigger will deposit in a shorten time after the entry of the flow in the lake. Delta deposits are formed when the flow enters the lake and coarse materials are deposited and the speed and carrying capacity diminishes. . Amount of sediment in a reservoir should be evaluated periodically, in this sense developing in the INCDMecatronica & Measurement Technique , a family of intelligent high- tech equipment used to monitor sediment, including the purchase of specific software , storage , processing and transmitting data. 3. CONSIDERATIONS REGARDING EVALUATION OF THE ACCURACY ASSESSMENT OF THE ROUNDNESS /D.D. Cioboata, D.D. Palade, A. Abalaru, D. Stanciu, L. Savu, C.Logofatu, F. Traistaru, pp. 74 – 80. Abstract.The measurement of parts roundness is a very important for manufacturing industry (for crankshafts, camshafts, bearings and guides measurement). The manner of determining the form deviations influences the accuracy and functionality of the mechanisms. This article presents some theoretical considerations on factors influencing the roundness assessment (evaluation method , the number of measurement points on the periphery of the part , distribution of measuring points, eccentricity of the part from rotation axis). The paper presents also a measurement software whose uncertainty will be determined by computerized simulation and experimental methods . 4. STANDARD TESSELLATION LANGUAGE IN RAPID PROTOTYPING TECHNOLOGY/ Ciobota Nastase-Dan, pp. 81- 85. Abstract. The growth of solid freeform fabrication ( SFF ) or layered manufacturing (LM) in biomedical applications has created the need for better technology in terms of model representation, accuracy and functionality. SFF models in medicine have been used mainly for assisting diagnosis, surgical planning, and manufacture of orthopedic implants. However, the technology has recently seen applications in the field of tissue engineering specifically in the fabrication of tissue scaffold structures. Traditionally, LM process involves the conversion of the 3D models into STereo-Lithography (. STL ) format, a tessellation procedure where the model is approximated by triangles, sliced and then fabricated by the machine. The procedure worked well in the manufacturing industry which used RP to evaluate product designs and aesthetics by producing actual prototypes of the proposed design. 5. PROGRAMMABLE LOGIC CONTROLLER USED IN DIMENSIONAL CONTROL /Constantinescu Alexandru, pp. 86 - 87. Abstract. This paper deals with PLC systems used in industry , their characteristics and similarities and differences between the two categories ( PLC and PAC ) analyzed . 6. What is "ADAPTRONICS" ? / Gheorghe Ion Gheorghe, pp. 88 - 91. Abstract. The scientific work deals with the new concept called ADAPTRONICS, implemented by INCD-Mecatronics & Measurement Technique and expressed by innovative and multi-disciplinary technological engineering, by the advanced science, by the hyper-advanced high-tech field, by active technology applicable structurally, by the mix of new structures and products, by the technical dialogue between research – development – innovation – commercial application and by the active exchange of experiences and new information transfer. 7. ASPECTS OF THE PARAMETRIC ANALYSIS OF HYPERSTATIC PLANE SYSTEMS COMPOSED OF TWO WELDED BEAMS (I) / Cornel Marin, Alexandru Marin, pp. 92-95. Abstract: The parametric analysis and design became of interest in the last time period due to the development of the computing technology and are widely used by the professional software. The parametric design is employed in the 2D and 3D professional modeling software, because it allows the reconstruction and change of the virtual model by changing one or more dimensional parameters. This work presents a simple example of parametric analysis of hyperstatic plane systems composed of two perpendicularly welded beams of the same length, using the force method for various loading scenarios with concentrated and distributed loads and bending moments. 8. ASPECTS OF THE PARAMETRIC ANALYSIS OF HYPERSTATIC PLANE SYSTEMS COMPOSED OF THREE WELDED BEAMS (II) /Cornel Marin, Alexandru Marin, pp.96-100. Abstract: The parametric analysis and design became of interest in the last time period due to the development of the computing technology and are widely used by the professional software. The parametric design is employed in the 2D and 3D professional modeling software, because it allows the reconstruction and change of the virtual model by changing one or more dimensional parameters. This work presents a simple example of parametric analysis of hyperstatic plane systems composed of three perpendicularly welded beams of the same length, using the force method for various loading scenarios with concentrated and distributed loads and bending moments. 9. ASPECTS OF ORTHOPEDIC IMPLANTS AND PROSTHESES. MATERIALS. PROCESSING TECHNOLOGIES / Simona Mihai, Viviana Filip, pp. 101- 106. Abstract. The goal of this paper is to summarize and present the types of orthopaedic implants and hip prostheses, the biocompatible materials used and the conventional and unconventional processing technologies used to make them. 10. SURFACE ROUGHNESS OF CONTACT LENSES INVESTIGATED WITH ATOMIC FORCE MICROSCOPY/ Stefan Talu, Mihai Talu, pp. 107 - 110. Abstract. The objective of this study is to make a comparison of surface roughness for various types of contact lenses (CLs), generated by the manufacturing process and to determine the roughness parameters of 3D surface using atomic force microscopy (AFM). Contact lenses commercially available from two manufacturers: Johnson & Johnson Vision Care (Jacksonville, USA) and CIBA Vision Corp. (Grosswallstadt, Germany) were investigated. Two lenses from each of the four contact lenses groups, manufactured by cast-moulding, were used in experiments. For imaging surface roughness of contact lenses on nanometer scale, we employed atomic force microscopy in tapping mode in an aqueous environment. Three parameters obtained by atomic force microscopy (Sa, Sq and St) were used in evaluation of contact lenses surface roughness. A comparison of surface roughness for the probed contact lenses was made. The surface roughness have a considerable influence on biocompatibility and generates important information about the material surface quality. The results obtained in this study may assist researchers in developing and prescribing contact lenses with optimal performance characteristics. 11. INVESTIGATION OF INTRAOCULAR LENSES SURFACE ROUGHNESS BY ATOMIC FORCE MICROSCOPY / Stefan Talu, Mihai Talu, pp. 111-114. Abstract. The aim of this study was to evaluate the surface roughness of intraocular lenses (IOLs) generated by the manufacturing process and to determine the roughness parameters of 3D surface using atomic force microscopy (AFM). Intraocular lenses commercially available from a single manufacturer: Pharmacia & Upjohn Co. were investigated. Three intraocular lenses, model 911A CeeOn Edge ® , were analyzed on different areas of the posterior optic surface. For imaging surface roughness of intraocular lenses on nanometer scale we employed atomic force microscopy in contact mode with ambient air. Three parameters obtained by atomic force microscopy (Sa, Sq and Sz) were used in evaluation of intraocular lenses surface roughness. The parameters of surface roughness are an auxiliary index of biocompatibility and generates useful information about the material surface quality. The information generated in study may assist researchers in choosing, designing and manufacturing of intraocular lenses with optimal performance characteristics. 12. A NEW APPROACH CONCERNING KINEMATICAL ANALYSIS OF CARDANIC TRANMISSION / Vladimir Dragos Tataru, pp. 115-118. Abstract: The paper presents a numerical method used for positional kinematical analysis of the cardanic transmission. For this purpose we first determine the differential equations describing the movement of the mechanism in the presence of constraints. These equations are written in the matrix form. Then, the system of differential equations obtained is integrated using numerical integration methods. 13. A NEW APPROACH CONCERNING KINEMATIC ANALYSIS OF SWINGING FORK MECHANISM / Vladimir Dragos Tataru, pp. 119 - 122. Abstract . The paper presents a numerical method used for positional kinematical analysis of the swinging fork mechanism.. For this purpose we first determine the differential equations describing the movement of the mechanism in the presence of constraints. These equations are written in the matrix form. Then, the system of differential equations obtained is integrated using numerical integration methods. 14. MICRO-NANO SYSTEM USED FOR PROBE POSITONING WITH NANOMETRIC PRECISION UNDER AFM MICROSCOPE / Vlad Vaduva, pp. 123 - 125. Abstract. Although atomic force microscope is an ultra - modern equipment, to use it at full capacity we need to find a method to handle the sample at nanometer level. This means in addition to translational motion that can be achieved on a microscope we need to design a device who can rotate the sample on all axes. 15. INFLUENCE OF TERMS T 1 AND T 2 FROM THE EQUILIBRIUM EQUATION FOR PRESSURE REDUCERS / Mircea Vladescu, Veronica Despa, pp. 126 - 129. Abstract. Experimental sets the percentage that each time the equation has to balance, influencing the final value of the output pressure of pressure reducers.